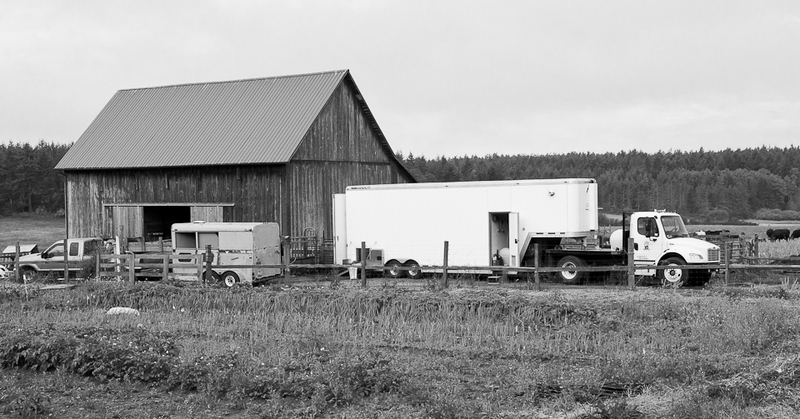 This fall is the tenth anniversary of the Island Grown Farmers Cooperative (IGFC) and the ninth year of USDA inspected meat processing with the IGFC’s Mobile Slaughter Unit (MSU) and its cut and wrap facility in Bow. To celebrate this milestone and to thank the Lopez Community Land Trust (LCLT) and community members that have made it possible, the IGFC is hosting an open house on Saturday, September 11th at 4:00 at the Lopez Center for the Community and the Arts (LCCA). As IGFC board members Bruce Dunlop and Barbara Thomas explained to me earlier this summer, the biggest reason for celebration is that the IGFC has accomplished what it set out to do: make raising livestock more profitable for local farmers and give consumers the opportunity to buy USDA inspected, locally grown meat by the piece at farm stands, farmers’ markets, and groceries. Before the MSU, farmers with cattle, sheep, pigs or goats to sell took them to the livestock auction in Marysville and farmers who wanted USDA inspected meat had to take their animals as far south as Centralia. Consumers who wanted to buy locally raised meat needed to find out who had inspected meat to sell by the piece or arrange a custom slaughter purchase of a quarter, half or whole animal and store it in their own freezer. For both farmers and consumers, things have changed a lot since the IGFC’s custom-designed, first in North America Mobile Slaughter Unit began arriving at local farms. This summer, farmers on Orcas, Lopez, and San Juan took time out of their busy schedules to tell me about the difference the IGFC and MSU have made for their businesses. Coffelts’ grass-fed meat is available at their farm stand and at the Orcas Farmers Market and is served in local restaurants. Other farmers had similar stories to tell. Stop by the LCCA on Saturday and meet the farmers, hear their stories, sample their product and celebrate the success of the IGFC.